It’s a perfect place to take a break and relax during your visit. Enjoy a range of savoury and sweet dishes, choose from a selection of wines, and help yourself to free self-serve tea and coffee. 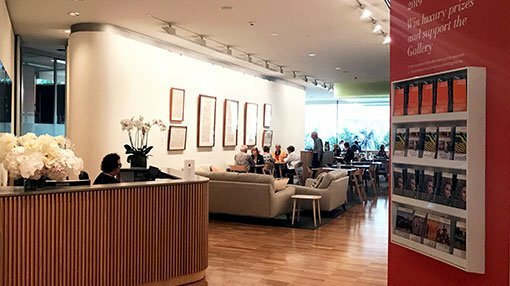 The lounge is a WiFi hotspot and has a well-stocked library with magazines, newspapers and art books. It also houses the offices for the members organisation, the Art Gallery Society of NSW. Wednesdays until 8.30pm for Art After Hours.